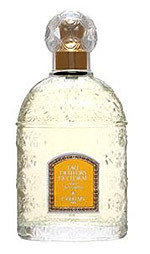 Eau de Fleurs de Cédrat is probably one of my favorite Guerlain fragrances. So it’s a good bit of fortune that I came upon it recently at La Signature at Disney Epcot in Florida. Eau de Fleurs de Cédrat is a classic from 1920 that is available at better stocked Guerlain counters, but more exclusively than Shalimar. Nothing wrong with you, Shalimar. I just see you everywhere. In Bottle: Lemons! I hope you like lemons because Eau de Fleurs de Cédrat is a big lemon tree. Green and crisp and citrus and fresh. Lacking the notable Guerlain base but still so lovely all the same. Applied: Sweet lemon candy is a strange introduction into Eau de Fleurs de Cédrat but it’s a welcome one as the fragrance matures immediately into a cool lemon. As this is a pretty simple mixture with low concentration Eau de Fleurs de Cédrat is a fleeting scent, even on clothing. It’s even more fleeting on the skin. After the lemon candy dissolves a bit, the lemon dominates the scene and an hour later, you’re left with a soft light, floral quality that’s just barely there and extremely fleeting. Don’t wear this if you want longevity. This fragrance has no base stage and I hesitate to say it may not have much of a mid-stage either. Wear if you want a quick fresh burst of fragrance from a sophisticated lemon-like note. I’ve had trouble with lemon notes in other fragrances so I was pleased to note that cedrat is not lemon necessarily but a close relative that smells much better on me. The cedrat in Eau de Fleurs de Cédrat is a lovely, soft, crisp little thing that won’t overstay its welcome or yell the entire time it’s there. Extra: Eau de Fleurs de Cédrat is pretty much what its name suggestions. It’s a flower and citron. It’s not trying to be anything else and if you do expect more complexity, this isn’t the place to look. The cedrat is similar to a lemon but has an icy and more candy-like fragrance. It smells remarkably similar to a lemon, but in a fragrance it couldn’t behave more differently. Design: Eau de Fleurs de Cédrat comes in a bee bottle design as a 100ml bottle. Lovely molded glass with bee designs on the glass itself. It both looks and feels luxurious , which is why I adore the bee bottles so much. La Signature, also known by many Epcot patrons as, “That store that sells really expensive French perfume that I’ve never heard of”, is probably the best place to go–short of Paris–for a big selection of Guerlain fragrances and their cosmetics line. I don’t use their cosmetics but the amount of Guerlain perfumes they’ve got there is fantastic. Reviewed in This Post: Eau de Fleurs de Cédrat, circa 2008, Eau de Cologne. This entry was posted in citrus, classic, fresh, guerlain, Reviews By House and tagged blog, candy, cedrat, citron, citrus, fleeting, fragrance, fresh, guerlain, lemon, perfume, simple, smell. Bookmark the permalink.